FAQ #9: Will You Write Another Book? I’d imagine writing a book is much like completing that other item on my bucket list — running a marathon. It’s an incredibly exhausting process but exhilarating at the same time and crossing the finish line not only feels great, it makes you want to do it again… someday. I will write another book. Someday. My next book will also be Google related. After all, it’s what I know best. I’ll save the details for a later time though as I want to flesh them out further and make sure no-one steals my ideas before I’m far enough down the line that I can’t be beaten to market. Note: this post is part of a series. For more, see the full list of FAQs. FAQ #8: What Other Books Are Similar to Yours? I have yet to come across any books that outline general marketing lessons learned from Google so I believe my book stands alone for this niche topic. List 3-4 competing books (preferably books which have been bestsellers or have been highly visible/influential in your content area) and positively distinguish your book. How is your book outstanding and unique, from both an editorial and a marketing perspective? If there are no direct competitors, cite the books that come closest. This book spells out new rules for operating in a Google world. My book will focus solely on marketing lessons rather than general business insights. And my book will be less about Google and more about companies that are applying lessons learned from Google. Also, by interspersing tweets and encouraging ongoing dialogue via Twitter, my book will be less static, more dynamic, and appeal to people that don’t have the attention span to read long-form text. This book is about the history of Google and importance of search. My book is less about search and more about principles of search that can be applied to all marketing tactics. But I will draw from what John did most successfully which was intertwine interviews with top Google brass and other industry pundits to weave the story together and make it more compelling. While this book is not about Google or search, it is about marketing. And it’s written in a style I’ll emulate in terms of quick, punchy copy and thought-provoking, often contrarian, sound-bytes. Further, the “Small is the New Big” point-of-view speaks to the changing paradigm in marketing that I’ll be highlighting in my book. The main difference is that I’ll demonstrate the new world order by focusing specifically on lessons learned from Google referencing the occasional tweet as opposed to Seth’s lessons culled from a wide (dare I say, wandering) swath of insights and experiences hashed out in blog posts. Note: I realize what I wrote is a bit brash but please keep in mind that I wrote this to sell McGraw-Hill on making me an offer. I can only hope that my readers will consider my book to be in the same ballpark as those written by Jarvis, Battelle, and Godin. ‘Nother Note: this post is part of a series. For more, see the full list of FAQs. FAQ #7: Who Is the Book Written For? Anyone with a stake in marketing, from small business owners to CEO’s of Fortune 500 corporations, will want to buy this book. That said, the sweet spot will be marketing professionals responsible for advertising, PR, promotions, product development, etc. These folks are either “client-side” working at in-house marketing departments or “agency-side” at marketing communications firms. A subset of this group that will be particularly interested in buying this book is search engine marketing professionals looking to apply their skills to the broader marketing mix. FAQ #6: What Was the Hardest Part About Writing the Book? It wasn’t too hard coming up with the topic. As discussed in FAQ #3, it just sort of came to me. And it wasn’t too hard getting my thoughts on paper. When I sat down to write, the copy flowed pretty freely. Far and away, the hardest part about writing this book was doing the research and coordinating interviews with key industry professionals. 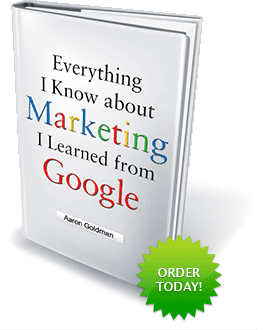 I knew that no-one would want to read 300+ pages of what Aaron Goldman thinks about Google and marketing. Rather, to make this book truly compelling, I’d need to offer up a comprehensive point-of-view shared by the most thoughtful and influential folks in the marketing world. As you can image, the most thoughtful and influential folks in the marketing world are also the busiest folks in just about all the world. Trying to coordinate interviews around their schedules proved to be a most tedious and arduous task. In some cases, I wasn’t able to get the information I needed until weeks or months after I had written the chapter into which the material would be inserted. This made things difficult for me. I’m definitely a linear writer. I do best when I start at the beginning and proceed to the end. Having to juggle an un-chronological (and sometimes illogical) research process definitely threw me for a loop. Ultimately, though, I was able to nail down a good 75%+ of the peoples whose input I sought and the manuscript came out all the better for having done it. FAQ #5: How Long Did It Take You to Write the Book? In calendar time, 3 months and 1 week. In total writing time, probably 4 weeks. I started writing the book (granted I had an outline to work off given my MediaPost columns — more on that in FAQ #2) the week between Christmas and New Years 2009. I spent about 5 full days (8am-6pm) writing that week. Then, for the next 2 months, I took off every Friday and a random day here and there to write. I also took off one full week in February. By “took off,” I mean turning on the out-of-office auto-responder and catching up on phone or email in the evenings. Finally, in March, I took about 3 days out of a 7-day family vacation in Mexico to write. After April 1st, I had a bit of a break while the book went through the editing process. I received the first batch of copyedited manuscript on May 11th and had until May 28th to provide my feedback. Then, I received the proofed pages on June 16th and turned around my comments by June 28th. My final deliverable was the index which I received on July 8th and sent back on July 12th. Now the book is off to the printers and should be rolling off the press any day now in time to hit stores on 8/27. FAQ #4: Did Google Approve This Book? When I first contacted Google’s PR department to secure interviews with specific employees, it was made very clear that Google could not endorse any particular book or author. However, they were happy to help me get in touch with key personnel and, for the most part, allowed the interviewees to speak with me unmonitored and uncensored. So do they prohibit it or just “cannot approve” it? While no-one from Google had contacted me about my use of LearnFromGoogle.com, I thought I better play it safe and switched to GoogleyLessons.com. Sure, the letters “Google” still appear in order in this domain but Googley is a different word with its own meaning so I hoped (and still hope) it’s kosher. As it were, Googley has turned out to be a more versatile phrase for use in my chapter summaries (Get Googley!) and, in general, conveys a more informal tone which is in line with my persona and the book’s narrative. Let’s just hope no-one from Google legal reads this post and decides to do more than “not approve” it! FAQ #3: How Did You Come Up With the Idea? As discussed in my post on how social media helped me land a book deal, my first idea (Tweet-o-biography) was rejected. But I had the ear of an editor and I couldn’t let that go to waste so I set out to find a more relevant topic for the McGraw-Hill Professional (MHP) catalog. After dropping that line one day, I got to thinking about the poster which made me consider that as affected as my brother’s life has been by Star Trek, mine has been by Google. From there, I started laying out life lessons learned from Google. The list quickly morphed to business lessons as that had been consuming my life at the time and viola, the idea was hatched. I thought the topic had book potential but I needed to be sure that 1) others would be interested in the topic and 2) that I had enough to say on the subject… so I set out to pen a series of bylines for MediaPost under the theme, “Everything I Need to Know About Marketing I Learned From Google.” These 3 columns became the outline of the book and the fodder I used to lure MHP into making me an offer. The title ended up getting shortened by MHP’s editors to remove “I Need” and the rest, as they say, is history. FAQ #2: How Did You Land Your Deal With McGraw-Hill? 4. Time - creating flexibility in one’s schedule is key to carving out the blocks needed to put pen to paper. See also FAQ #5. 5. Luck – always a factor! FAQ #1: What Made You Want to Write a Book? In four to six paragraphs, please describe your book, its purpose, approach, and content. What prompted you to write the book now? Describe any significant trends, events or current news relating to the subject matter of your book. What are the outstanding, distinctive, or innovative features of the book? I’ve always wanted to write a book. Now that I’ve started a family, it’s one of two things left on my bucket list. The other is running a marathon. I figure my knees will hold up better then my fingers — what with the carpal tunnel setting in from all the blackberrying and blogging I do — so I’d better get going on that book. I’ve always loved to write. I was the sports editor of my high school paper. I worked at my college newspaper — granted that was an ad sales gig. And I currently publish a byline every two weeks in one of the largest internet marketing trade publications — in addition to authoring some fifteen odd blogs. I’m ready to write this book. When I started my own company in April of this year, I finally took control of my professional destiny, as well as my personal calendar. Accordingly, I’ve been able to set my own priorities and publishing a book is at the top of the list. The industry is ready for me to write this book. Google is everywhere. It’s loved and feared all at the same time. But, more importantly, it’s well-known and used by billions. For business professionals, Google is not only part of the every-day routine navigating the web, it’s a core component of the corporate marketing mix. (Google currently generates over $20 billion in advertising revenue globally and accounts for over 25% of all internet advertising spend.) The ubiquity of Google and the uniqueness of its corporate culture make it a subject everyone can relate to. I’ve learned so much from Google. Having been involved in internet advertising for over ten years and spent hundreds of millions of dollars with Google on behalf of my clients, I have a unique window into where the company’s been, where it’s going, and what’s made it so successful. These lessons transcend advertising with Google, advertising on the Internet, and even advertising in general. These lessons can be applied to every aspect of marketing from public relations to product development to promotions to brand strategy. As the publication date draws near and promotional activity reaches a fevered pitch, I’ve been getting lots of questions about the process of writing a book and my plans for future projects. I’ve assembled the most frequently asked questions here and, starting on Monday, I’ll address one each day until I cover them all. Please feel free to add more to this list in the comments. 1. What made you want to write a book? 2. How did you land your deal with McGraw-Hill? 3. How did you come up with the idea? 4. Did Google approve this book? 5. How long did it take you to write the book? 6. What was the hardest part about writing the book? 7.	Who is the book written for? 8. What others books are similar to yours? 9. Will you write another book?